Hello there stamping friends. Welcome to the first Stampin' Up! 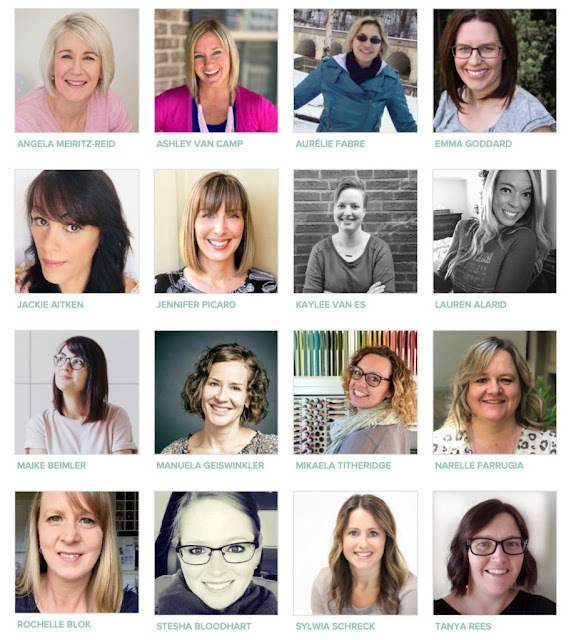 Artisan Design Team Blog Hop for 2019. I'm so excited for this day, that it has finally arrived and I'm super excited to be finally sharing my creations with you. 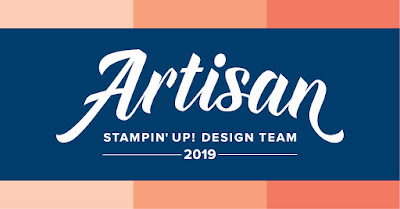 This day has been a long time coming since I got the call last year to be on the Artisan Design Team. I'm so excited to be sharing this year with this amazing group of sixteen demonstrators from around the globe. I'm still pinching myself that I have been chosen for round 2 of being a Stampin' Up! Artisan and I'm so honoured to be one of the 5 chosen from the South Pacific Region (Australia and New Zealand). What do the Stampin' Up! Artisan Design Team do? We are all experienced craft bloggers who create and share inspiration with you all once or twice a month using Stampin' Up! Products. As well as hopping on a regular basis through out the year we also provide tips for Stampin' Up!s Instagram page and as well as have projects posted on the Stampin' Up! Corporate Blog Facebook Page. It's a big gig but its so rewarding and worthwhile. If you haven't hopped on to my blog before, just a little bit about me before we move on to the projects. My name is Rochelle Blok and I live in the South-Eastern Suburbs of Melbourne. I’ve been married for 17 fabulous years to Wayne and we have 3 amazing children, 2 boys and a girl, aged 15, 13, and 10. I fell in love with Stampin’ Up! about 8 years ago when my mum showed me my first Stampin’ Up! catalogue and I just “had to have it all”! I just celebrated my 5-year anniversary as a Stampin’ Up! demonstrator but you could say that I have enjoyed papercrafting since I was a little girl. 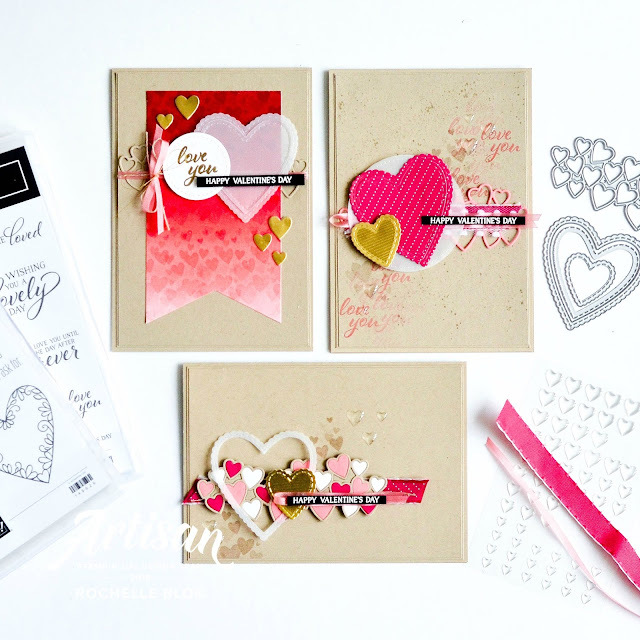 I’ve always been crafty and have tried many different forms—cross stitch, scrapbooking, knitting, and embroidery—but I have to say that cardmaking and papercrafting have always been No.1. I would have to say that my creative style is lots of layers, lots of ribbon and trim, and all things delicate and pretty—sometimes putting things together that don’t necessarily go together but still look good. Everything has to have some sparkle or bling. I just love crafting and creating and I don’t know how I would cope if I didn’t have that creative outlet, even if it is just colouring something in. I have to be creating/crafting something. Now on to my creations! This months hop we are focusing on the Forever Lovely Stamp Set, Lovely Flowers Edgelits Dies, Meant to Be Stamp Set and the Be Mine Stitched Framelits Dies. 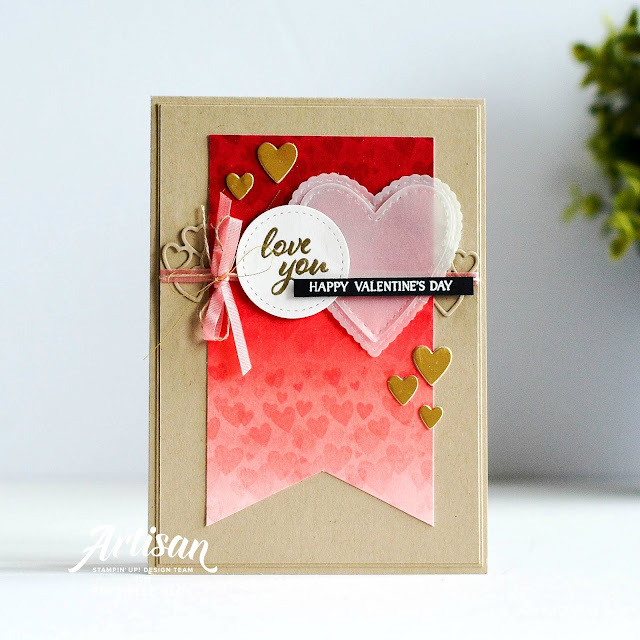 Just in time to have some projects made for Valentine's Day.I've strayed away a little bit from my usual style of creating but have really love how the cards have turn out. I've made three cards for you today, incorporating and intertwining all the focus products. All the focus products are fabulous and fantastic on their own but really are even more fabulous when you use them all together. 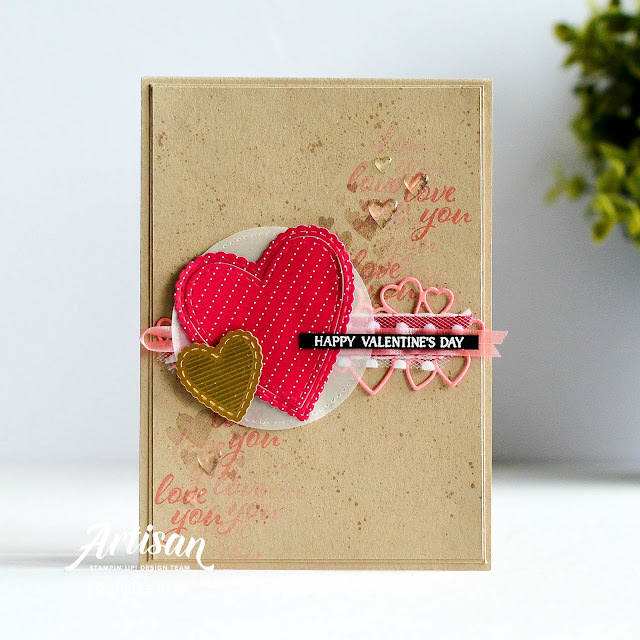 My first card, I was really drawn to the heart image in the Forever Lovely Stamp Set and instantly was drawn to repeatedly stamping the hearts to make my own background piece. I first, using a sponge brayer, sponged the colours for and Ombre look, graduating from darkest to lightest, and then using the same in colours down the card stock repeatedly stamped the hearts for and 'heartfilled' card. A bit of Ombre and stamping and you have your own custom background. How gorgeous are those dies from the Be Mine Stitched Framelits Dies? Just love the stitched outline edge and the hearts outline piece with all the different sized hearts all together would have to be one of my favourite dies at the moment. Super pretty and super fun. 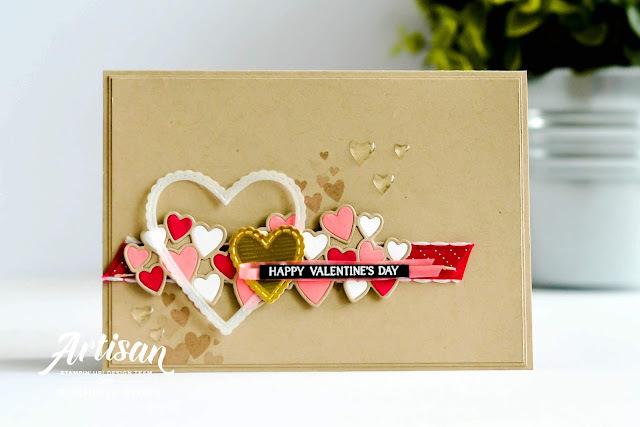 My last card I die cut four of he longer heart outline die and the using all the different colours, infilled the hearts to create a fun and different look. Putting all the different coloured heart pieces back in and then adhering them does take a little bit of time but it really does create a gorgeous effect. Why not try it with a different colour combo? All a little bit something different for my style but all a bit fun! The Artisan Design Team will be hopping again in a few weeks so be sure to check back often. Make sure that you follow us on our blogs, on Instagram or on Facebook. Let's get social! The ever amazing Stesha Bloodhart is next up on the hop. I love Stesha's creations and am so thrilled to be sharing this Artisan year with her and all the other amazing Artisans. Be sure to head on over and check out what she and the rest of the Artisan Team have to show you by clicking the next button below. 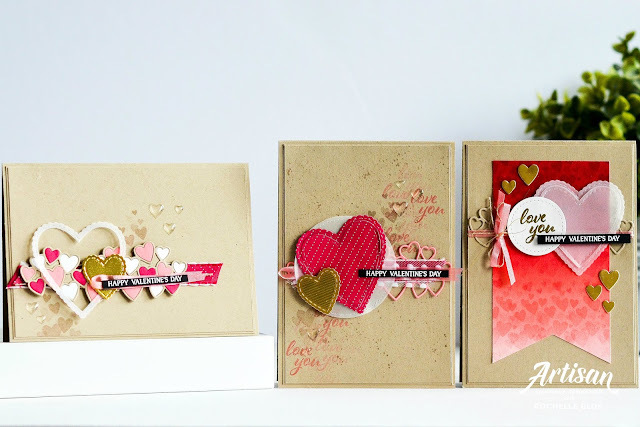 Recreate these cards at home using the following Stampin' Up! products. Click on the images below to see the product information and to shop from my online store. I love all of your cards! They all are wonderful, the one with the stamped background is my favorite!! All three cards are beautiful! I am very glad that you are back! Absolutely fantastic and beautiful! Congratulations on being chosen to the Artisan group...What an honor! I'm looking forward to your year of creations! I immediately thought, it's so strong, so sharp! The little hearts recovered and the golden combo and Brune dune, I love it! So excited you are an Artisan! I always love your work! These cards are beautiful! Love it! So many fun ideas I want to do. :-) You are one talented gal! I’m completely in awe! Each is a gorgeous piece of art! Lovely cards. 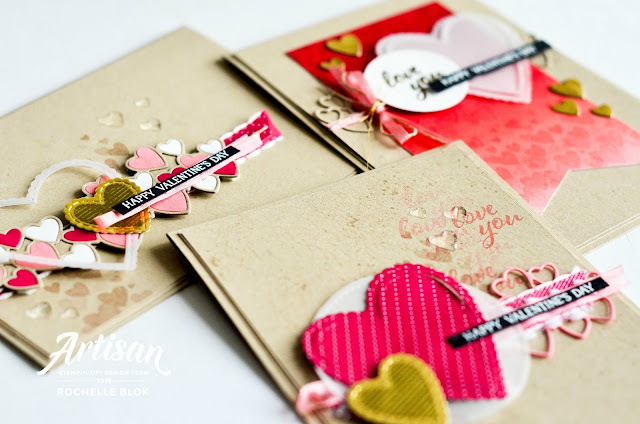 I especially love the infilled hearts--such a great idea! In line with Data Protection legislation (GDPR) by commenting you do so in the knowledge that your name & comment are visible to all who visit this blog and thereby consent to the use of that personal information for that specific purpose.